makes use of the producer-consumer mechanism for the exchange of data between safe nodes. In this context, a consumer is designated “originator” and a producer is called “target”. Safe time synchronization between producers and consumers relies on chronological monitoring. Synchronicity between all nodes throughout the network provided, the time of origination of safe messages can be determined using a time stamp. These methods guarantee that processed data is still up to date. For the transfer of the safe data, “Safety Validator Objects” are used. They organize and guarantee the integrity of messages in a CIP Safety network. These objects also constitute the bridge between the safety communication and the field bus or network used. For data transmission, the protocol provides single transfer or multicast connections. Their use depends on the capability of the channel used to support either of these connections. 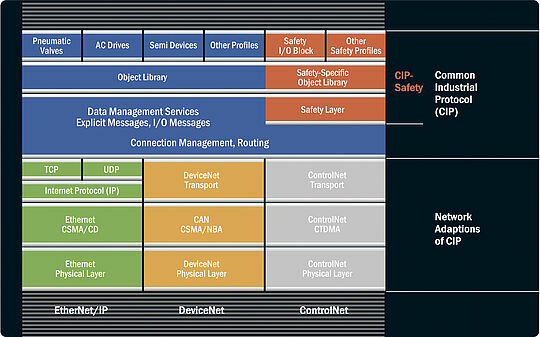 For CRC (cyclic redundancy check) calculation, the CIP Safety protocol makes use of five different formats, ranging from 8 bit to 32 bit CRC. These depend on whether data size is one or two Bytes or between three and 254 bytes and of the data range to be covered by checksum calculation. A “Unique Node Identifier” (UNID) is used for the unique identification of the safe nodes. It is a combination of a network ID and the node address, which is equivalent to the MAC address. It can be set either manually using DIP switches or via software configuration. During the ramp-up phase, the originator checks the presence of the configured UNIDs in the network. Further parameters such as timeout delays, ping intervals or the maximum number of nodes are configured using a Safety Configuration Tool (SNCT).